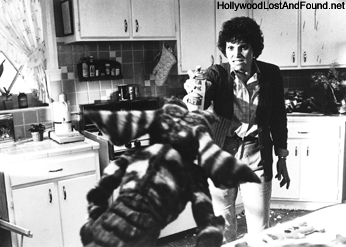 "Gremlins" (1984) Set during Christmas... but scary enough for Halloween. 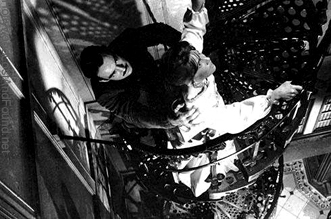 "The Haunting" (1963) The best haunted house movie of all time (just say NO to the remake). 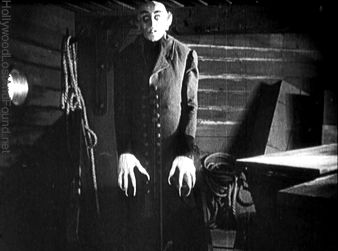 "Nosferatu" (1922) The title vampire still gives me nightmares... and he's only on screen for a few minutes. 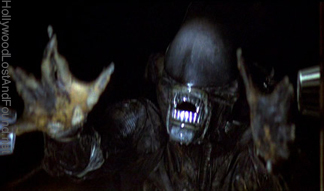 "Alien" (1979) "Surprise!" No one can hear you scream in space... but the exposions are still pretty loud. 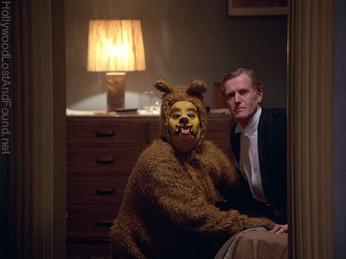 "The Shining" (1980) "Sorry, wrong room." A brilliant example of how to put an audience on edge - Kubrick marvelously creates an unsettling, desolate, horrifying environment. 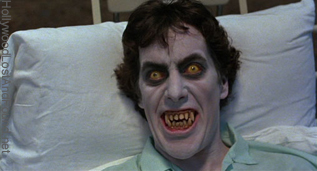 "An American Werewolf in London" (1981) John Landis brilliantly mixes comedy and horror. This moment was the biggest jump for me - and it's an image that's only on screen for about a second. Happy Halloween! Be safe while trick-or-treating! Robert Goulet died yesterday (Tuesday, 10/30) in a Los Angeles hospital as he awaited a lung transplant. He was 73. He would go on to dozens of other musicals, and many TV and film roles. Movie appearances included “Beetlejuice” and “The Naked Gun 2-1/2.” He was the singing voice of Wheezy the Penguin in “Toy Story 2” and the voice of Jaune-Tom the cat in “Gay Purr-ee” with Judy Garland. Most recently, Goulet starred in a hilarious commercial for Emerald Nuts. 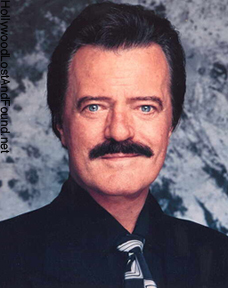 Read Robert Goulet's obituary here... visit his IMDB page here. It's hard to find someone in California who hasn't been affected by the tragic wildfires here in some way - least of which included Hollywood productions. Two historic films - "Battleship Potemkin" and "The Jazz Singer" - have been remastered for DVD release. Many of Stanley Kubrick films, including "2001: A Space Odyssey," "A Clockwork Orange" and "The Shining" have been released on DVD with new special features added that have never been available before. 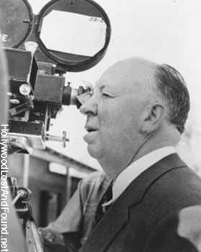 Anthony Hopkins may play Alfred Hitchcock. The Academy of Motion Pictures Arts and Sciences has just awarded $450,000 in grants to 20 U.S. film festivals. USA Today has scooped the first picture of the Predalien - a hybrid of the title creatures from "Alien" and "Predator" that will feature prominently in the new "Aliens vs. Predator" film. 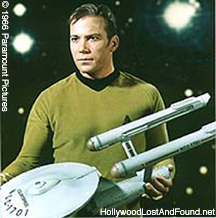 As of this moment, William Shatner will not be in the new "Star Trek" movie. But it's still early... we'll check back. Here's a report on some upcoming Holiday films, including "Bee Movie," "American Gangster," "The Mist," "Sweeney Todd" and others. There's less than a week to go before there could be a Writer's Strike... and negotiations are still in progress. And now the federal government has stepped in to mediate negotiations. The studios are preparing for the worst, however - the "The Da Vinci Code" sequel is being rushed forward, and producers of the new "Wolverine" movie are finishing their script before the deadline. 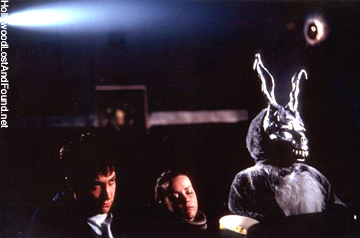 Have a good week - and be safe while you're out Trick-or-Treating! Ian McKellen is eager to play Gandalf in "The Hobbit" - and he has Peter Jackson's support. 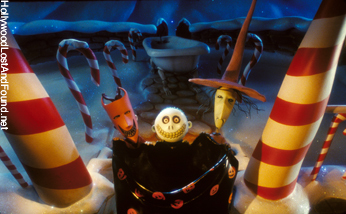 "Nightmare Before Christmas" in 3-D has opened, and director Henry Selick was on hand at the El Capitan in Hollywood to talk about it. Here's an MSNBC interview with James Lipton of "Inside the Actors Studio." Luke Skywalker's lightsaber is already stowed aboard the space shuttle, waiting for its launch on the 23rd. J.K. Rowling has revealed that Harry Potter character Dumbledore is gay. And finally.... there could be more than just trick-or-treaters on the street this Halloween. The Writer's Guild has authorized a strike, and their contract is up on October 31st. Have a good week... and, everyone, send your best thoughts and wishes to all the firefighters working hard in California right now! 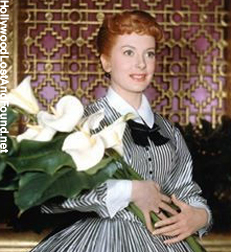 Actress Deborah Kerr died Tuesday (10/16) of Parkinson's disease. She was 86. Born on September 30th, 1921, in Helensburgh, Scotland, Kerr made her first film appearance in "Major Barbara" (1941) in British cinema before moving to the US. She will probably be best remembered for sharing one of the most famous kisses in movie history with Burt Lancaster in "From Here to Eternity" (1953), and for her role in the film version of "The King and I" (1956) with Yul Brynner - she was honored with an Academy Award nomination for both roles. Nominated four more times - for "Edward, My Son" (1949), "Heaven Knows, Mr. Allison" (1957), "Separate Tables" (1958), and "The Sundowners" (1960) - she never won an Oscar. She was given an Honorary Academy Award in 1994. She is survived by her husband Peter Viertel, two children from a previous marriage, and three grandchildren. You can read her obituary here on Reuters, and her credit list here on IMDB. 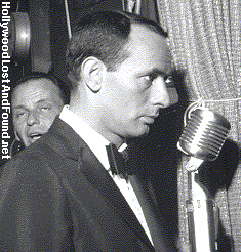 Comedian Joey Bishop, the last surviving member of Frank Sinatra's legendary "Rat Pack," died Wednesday (10/17) at his home in Newport Beach. He was 89. Appearing at the Sands Hotel in Las Vegas in the early 1960s in a musical-comedy review, The Rat Pack - consisting of Bishop, Frank Sinatra, Dean Martin, Peter Lawford and Sammy Davis Jr. - became a show business sensation. Together they also starred in films "Ocean's Eleven" (1960) and "Sergeants 3" (1962). Bishop was also featured in "The Naked and the Dead" (1958), "Onion-head" (1958), "Johnny Cool" (1963), "Texas Across the River" (1966), "Valley of the Dolls" (1967) and "The Delta Force" (1986). He starred in two TV series - both called "The Joey Bishop Show" - before appearing as a guest or fill-in host in a variety of other programs. He stood in for Johnny Carson 205 times. 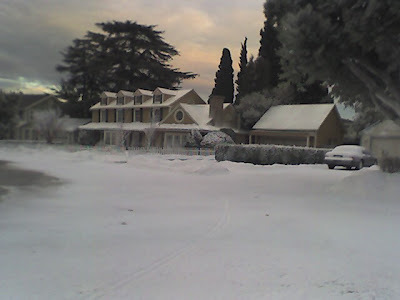 He is survived by son Larry Bishop; grandchildren Scott and Kirk Bishop; and his companion Nora Garabotti. Read his obituary here on Reuters, and her credit list here on IMDB. 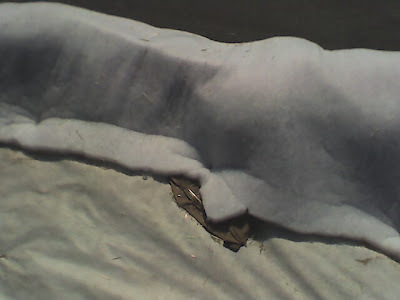 First, they laid drift foundations with ordinary Christmas bedding. 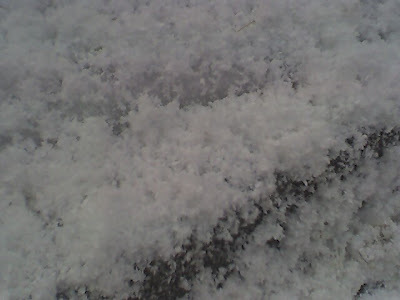 Then they sprayed over it with a white pasty texture, kinda like old ceiling texture. 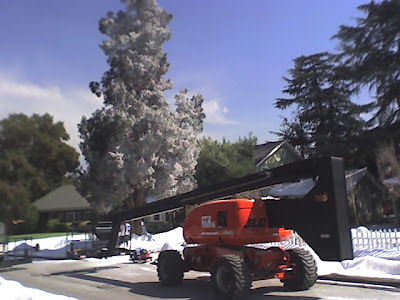 They even flocked the trees. Great detail! 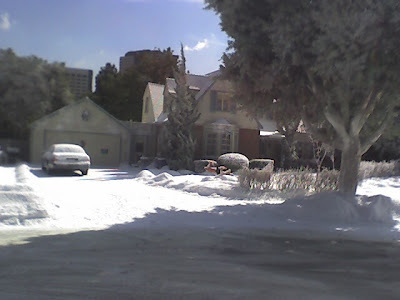 I thought this car in the "Bewitched" house's driveway was nicely covered too. 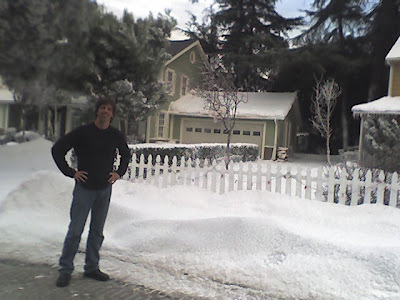 Me in front of the "Griswold's" ( was used in the "Vacation" movie series). The truck responsible. 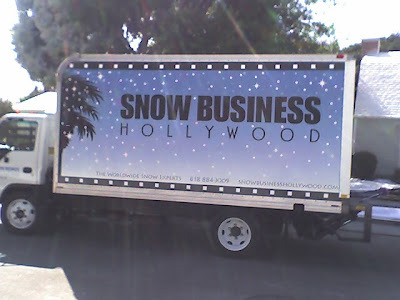 Visit the Snow Business website. I guess that's about as close as I will be getting to a blizzard in LA anytime soon. “Poltergeist” (1982) will be screening on October 25th at the Academy's Linwood Dunn Theater in Hollywood - with several of the film makers (including Oscar nominated sound editors Richard Anderson and Stephen Flick) in attendance. 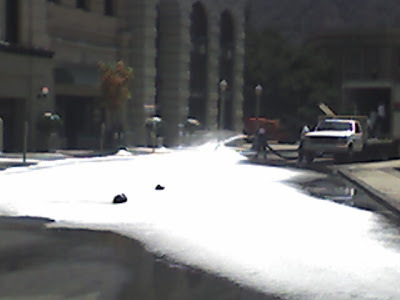 NBC Studios is leaving Burbank. A new play opening in Chicago, "Completely Hollywood (abridged)" is a parody of the film industry - and this review reads like a movie producer's notes. According to Nikki Finke, Warner Bros president of production Jeff Robinov has said that "We are no longer doing movies with women in the lead." Roger Moore is shopping for a publisher of his biography. More news on the possible impending Writer's Strike... now members have been told that they may not write for animated features if a strike should occur - even though animation is usually not covered by the WGA. Memorabilia from "Easy Rider" has sold at an auction, including the American flag taken from the back of Peter Fonda's jacket. ...And Wilhelm screams again on ABC World News (I was actually interviewed for the piece, but it was too short to include me). Peter Weller, star of "Buckaroo Banzai" and "RoboCop," can add "college professor" to his resume as well. The trailer for the Tim Burton's film version of "Sweeney Todd" with Johnny Depp has premiered. 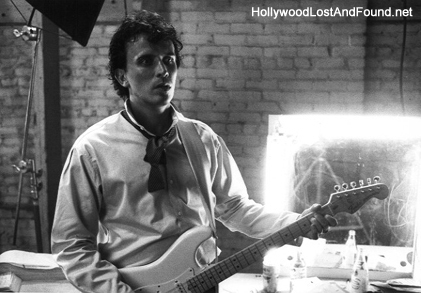 Read more about the author of a Hollywood Locations book that I use quite a bit. If you wanted to download the pilot of the "Stargate Atlantis" series from iTunes, you may have gotten Episode 4 instead. Owen Wilson made a brief appearance at the premiere of his new film by sneaking into the Academy. 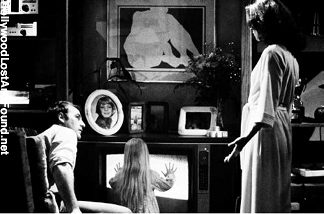 Screenings of "Poltergeist" in theaters to promote the DVD release were from a pan-and-scan master - the DVD is, of course, letterboxed. And even worse, the audio was in MONO! There's been an arrest in the theft of Indiana Jones materials from the set of the new film. Martin Scorsese has signed to direct a film about the life of George Harrison. Everyone can relax - a release date has been reserved for "Transformers 2." 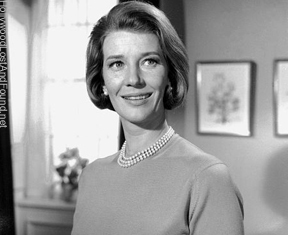 Lois Maxwell, who played Miss Moneypenny in 14 James Bond films, has died. "Carrie" will be screening in New York on October 15th, with director Brian De Palma in attendance. Bonnie Hunt - whom I personally have a huge crush on - will host a new talk show next year. Francis Ford Coppola's laptop has been stolen. ...And someone has paid $47,100 to charity for a role in Will Ferrell's new movie.